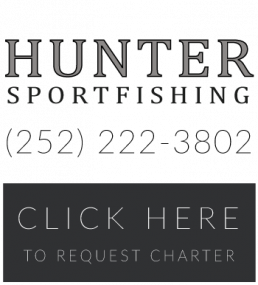 Hunter Sportfishing offers you the best sportfishing out of Morehead City, North Carolina. Hop on board for a trip you’ll never forget! If you have any questions or would like to book your next fishing trip please don’t hesitate to contact us, we’d love to help. HUNTER is a 50 foot Buddy Harris sportfisher built in Marshallberg, North Carolina. The boat is fully equipped with fishing and navigation equipment as well as an air conditioned salon, restroom, fresh water, microwave and a professional crew to take care of your needs. Our equipment includes Shimano Tiagra 50s and 80s, Shimano TLDs, Garmin chirp depth finder and everything necessary for a great day of fishing!